As more and more companies ramp up their Twitter presence, the likelihood that something off-message will slip by the digital goalie goes up considerably. The question is not whether your company will have to deal with self-destructive corporate Tweets, but what kind of tweet it will be, and by whom. These increasingly common Twitter mistakes occur when the administrator of the corporate Twitter account inadvertently sends a tweet from the company instead of from that person’s individual Twitter handle. As usage of tools like CoTweet (client) and Hootsuite soar, this becomes an ever-more-likely scenario. It’s happened to me, as my awesome assistant Jess Ostroff once accidentally yelled at a company from my Twitter account instead of her own. 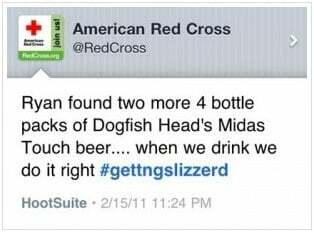 Nobody was fired, but I suspect there was a reminder about being careful with corporate Tweets. 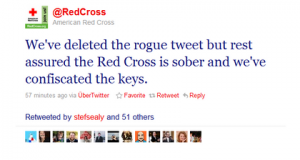 The American Red Cross has been widely lauded for their deftness in this situation. Read a great post on Tactical Philanthropy from their social media manager Wendy Harman, who gives an intriguing blow-by-blow. These types of Twitter mistakes are a bit more disconcerting, as you get into questions of appropriateness and poor listening. The Tone Deaf error occurs when the official corporate Twitter account (or personal account of a high-ranking officer) throws up an air ball of a tweet that is outside customary social and societal norms. Appropriate Response: Well, Kenneth Cole isn’t going to fire himself, and the “Tone Deaf” error is usually void of malicious intent. It’s a misunderstanding and/or misreading of the cultural tea leaves. These kind of Twitter mistakes become more and more common in real-time business as the pace forces companies to use monitoring software that can miss sarcasm and satire. This is where it gets sticky, because you’re dealing with judgment and the convergence between personal and professional selves. This is where people misplace the filter between mind and keyboard, or have a different understanding than their employer about what should be filtered. She used to go by the Twitter handle of @SweetLeafApril and mixed personal musings with customer service and community advocacy. She proudly displays her passion for music, cycling, and having a good time and attracted a following of 4,000+ on Twitter. Appropriate Response: Typically, it’s censure or worse. It’s a tricky situation for the company, because the “TMI” transgression always comes from a personal account, rather than the official corporate Twitter account. So, does the company send a tweet from the main account, apologizing for something said on an employee account that may have little cross-over audience? In most cases, no. Ketchum apologized via a statement only after the FedEx dust-up became big news around ad industry water coolers. Andrews was reprimanded, and eventually left to start his own firm. Sweet Leaf Tea (owned by Nestle) has never publicly mentioned April’s tweet. She was suspended and then terminated. The company deleted the entire @SweetLeafApril account. What do you think of the 3 self-destructive types of corporate tweets and the appropriate punishments for each? Is termination justified? What would you do in your company?